Funko Pop! is hitting the market place with some really awesome Funko Figures for Thor Ragnarok. There are not quite as many variants as there were for Spider-Man Homecoming. That is to be expected though as Spider-Man is a perenial top seller of merchandise well above the other heroes. The figures were released exculsively from the Marvel Youtube show called Thwip! All pictures are from the show. You can find it on youtube. I am going to embed the show directly on this page but to be honest I hate this show. There now been more Funko Figure images released. These images include figures, mystery minis, dorbz and plushes. Some of these Funko Figure pictures are potentially spoilerific. They show characters that have not revealed to be in the film as of yet in the trailers. Spoiler Warning...Be warned some Funkos are of characters not yet revealed. Alright alright Rant over I will discuss the Funkos. 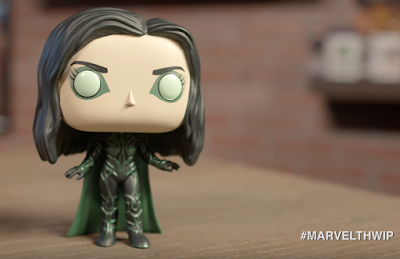 I think the best Funko here is Hela. There are two Hela's one without a Helment and one with Helment and while both are cool I totally dig the helmented version. Her eyes glow in the dark which is a cool element. Hulk is another standout for me in Gladiator Gear he looks pretty cool. He has his helment and his hammer. He also has the cool white gladiator markings going down his face and his arms. I do wish he was a little more bulky though. I don't quite get the immediate that is Hulk feeling from this figure because he is a little skinny. He could be easily mistaken for an Orc. Thor looks good but I find it odd that he is bearded and has long hair. In this film he is sporting shorter hair in the arena. That seems like a missed opportunity to do something unique with him. I would also like to see the red face paint slash that he has in promo materials. None of these figures did much for me. Heimdall looks the coolest but I don't immediatly think Heimdall when I see him. I really like his classic look better. Maybe after the film I will feel differently. Really I have the same beef with Loki here in that without his helment and staff he is much less distinctive. I do wish we recieved a Bersker Funko. The Berskers are what they are calling the demonic minions of Hela and from what I have seen in the Lego sets they look really cool. Alright now of some of the Spoilery Stuff! Here is the Funko that is perhaps the coolest in the whole set. A character that has not yet been revealed in the trailers but has long been speculated to be in the film. Some of you have already guessed it. And dang is he awesome! He is made in part with transparent orange plastic and he looks amazing! This is a Game Stop exclusive Funko Pop! and I may be taking a trip to Game Stop just to get this. Alright the Mystery Minis are very cool I see a few that are really stand outs. These are I think the best of the Thor Ragnarok Funko figures. So much cool stuff here. I love the Odin he looks all zen and Yoda like, which is kind of a different pose for the All Father. Then Surtur and Hela both look amazing. I don't like the Surtur figure quite as much as the Surtur Funko Pop because it lacks that translucent flame quality but yeah it is still awesome. The Hela might actually be cooler as it looks more detailed. I think I see two Valkyries there and they look great. A couple of characters appear here that I wasn't sure would be in the film. The Fenris Wolf is in there... Yup that is right Amigos the Fenris Wolf looks to be in the film. Fenris also appeared in a Lego set. There is also Miek and Korg from Hulk's Warbound from the Planet Hulk and World War Hulk storylines. These are both cool characters who I hoped would be here..and THEY ARE! Also along these same lines there is a Sakaaran Guard who is striking in a red armor. The Gladiator Hulk and Gladiator Thor are both awesome variants of traditional characters both look like bad asses in these models. Loki, Collector both look good. Heimdall hmmm still not sure if I like his outfit compared to the old but I like this mystery mini better than the larger Pop. Maybe his look will grow on me. Ildris Elba is one of my favorite actors so I have no doubt he will sell me on this look if nothing else. Likely my least favorite is Bruce Banner. He just seems like a dude. That said I could likely do some science bros stuff with him. I don't see any surprises here but they are fun and cool. I like the Loki one. One worry is that Thor's beard in this photo looks brown and come on that needs to be blonde.